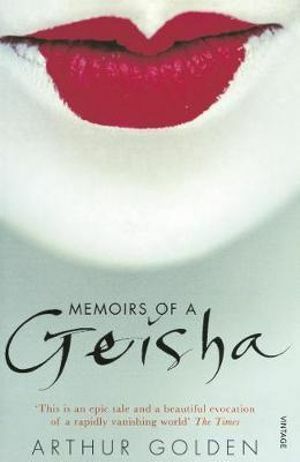 Holiday Review: Memoirs of a Geisha - Arthur Golden | What Does Mel Think? This was the second book I read on holiday and I finished it within 3 days! So already you're seeing where this is going, it's now sitting proudly next to my most loved books. It was one of those books that from the first page you are just hooked. This book is historical fiction set in a little town in Japan called Kyoto, and follows the life of Chiyo, who is also known as Sayuri (when she becomes a geisha). The story is told from an older wiser perspective and we are able to travel along her journey from a young innocent girl from a fishing village, to one of the most successful Geisha. There are so many different elements to this book, love, tragedy, humour, drama and of course an insight into the very foreign Geisha culture. I am not an expert in Japanese culture so I cannot say how accurate this was, however it has made me very curious and willing to learn more about it. I find it fascinating that they dedicate their whole lives to perfecting their craft, it is a path that is chosen for them and they follow it through for the rest of their lives. Also, what I love most is the charming way it is written. Sayuri is the most wise, intelligent narrator, she uses many metaphors that you would never even think of such as: “Hopes are like hair ornaments. Girls want to wear too many of them. When they become old women they look silly wearing even one.”. Does that not just give you such beautiful imagery? These kind of comparisons happen all over the book and it's just a pleasure to read. Again I have to say, as I did last week, the ending wasn't what I'd hoped for. It ended with the resolution she wanted but I really had hoped for a skip back to the present and a page or so about her life now. There was a part when she was living away because of the war as well that I didn't really enjoy as much as, although it was relevant to hear about, went on for a bit too long. It was the only part of the whole book when I felt a bit bored. Other than that I would say it is one of the best books I've read. I think an age limit is needed because it can get very graphic and deep so probably 16+. However, it should definitely be on everyone's list to read because I feel it's so important to take an interest in these different cultures but also it's just a really really good book. Leave a comment below if you've read the book or want to read it. Also, if you've watched the film, what did you think of it? I think I'm going to watch it soon so I want to see if it's worth my time! Check out my last Holiday Review here. I seriously love this book so much. Reading this makes me want to re-read it! And I would definitely recommend watching the film. As all adaptations go it was forced to cut some things out so pieces are missing, but I do think it stays true to the heart of the story. In terms of accuracy it is fairly accurate, I believe. The only thing I can think of is that the geisha he interviewed to write this was furious that he included the mizuage because she insisted such a tradition never existed. Which isn't really true- it did exist at least at some point in time- but it is likely that the tradition had been stopped by time she went through the process. Or at least stopped in the major cities? I'm not exactly sure. So that might be a bit idiosyncratic but I don't know for sure.